The sharp mind of a German Shepherd allows him to be an excellent working dog and an immensely loyal family dog. If you have this loveable breed in your life, you know how important toys can be to keep his brain focused. But what toys are best for his noggin? **These links will take you to Amazon, if you'd like to see prices and reviews. 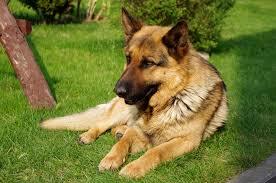 As the name of the breed implies, German Shepherds originally hail from Germany. Yet their reputation as a wonder dog of sorts comes directly from Hollywood. The world’s first canine movie star, Rin Tin Tin, was a German Shepherd. While the silver screen proved German Shepherds are ready for their close-up, they have long since proven their combination of intellect and working/herding instincts makes them perfect for much more serious jobs. They can be readily trained to be guide dogs, for search and rescue units, and to partake in grittier activities like K-9 and military patrols. A German Shepherd is also a highly adaptable breed; willingly able to adjust his life to fit your lifestyle. This particular trait allows him to get along with children very well, which leads many to think of German Shepherds as the ultimate family dog. This adaptable behavior fosters great loyalty between the dog and the owner; however, German Shepherds can act aloof around strangers, especially if they sense that the family they love is in danger. A properly socialized Shepherd won’t be as uptight, but you shouldn’t expect him to cuddle up to people outside of your family. While German Shepherds can adapt to your lifestyle, there is one thing that you cannot compromise on with this breed: exercise. This breed is filled with a ton of energy, and they need consistent outlets to burn it off. If they don’t, your furniture, backyard, and other parts of your home could pay a dear price. Play-time: How Does a German Shepherd Like to Play? A German Shepherd is smart and energetic. As such, his ideal playtime will stimulate his body and his mind. If you don’t find ways to meet his needs on either front, he’ll end up making amusement for himself. The obvious way for a German Shepherd to get his body moving is to go for a nice long walk. He’ll want to do this on a daily basis, rain or shine, which means you need to be ready to reciprocate this feeling. If you have a back yard or a large space where he can run around unencumbered by a leash, you can help him burn off energy by engaging him in a game of fetch. Typically, a good 15-minute session of fetch will be enough to make him happy. This game can also keep his mind active, as he’ll have to use his noggin to figure out where the object he’s fetching landed. Another terrific game to play to stimulate your pooch’s mind is “where’s your toy.” It’s a simple game based on hide and seek, and it is a great way to train your German Shepherd to use the working instincts he would deploy as part of a K-9 unit. In order to play this game, you’d start by putting one of his favorite toys in plain sight, and asking “where’s your toy?” Obviously, he’ll find it in no time. When he does, be sure to lavish him with heaps of praise. Over time, you will gradually place the toy in various stages of concealment. You’ll eventually get to the point where you will have the toy completely hidden from view, and it will be up to him to sniff it out. German Shepherds love this game because it’s a puzzle that keeps their mind from wandering; you’ll love it because it’s easy to set up and will keep him out of trouble. The one caveat to this game is to make sure the German Shepherd can always get to the toy easily. This breed has a tendency to dig, and these instincts may kick in if you make the hidden object too difficult for him to retrieve. Also, it practically goes without saying that you should refrain from burying his toys in your lawn or backyard. What Kinds of Toys are Right for This Loveable Breed? German Shepherds are large breeds whose teeth can do some pretty severe damage to your belongings if he’s bored. Because of this, it’s important that the toys you buy him are durable. If you don’t, you’ll find yourself going through a ton of toys at a pace much faster than you’d like. It’s also a good idea to consider toys that are geared toward keeping your big buddy physically active. Toys that fall into this category are akin to the kind of stuff you can use to play fetch. If you go this route, make sure you have a sizeable space to allow him to frolic freely. With that being said, a German Shepherd will need a little more than mere fetch toys to keep him stimulated. To that end, there are several interactive toys on the market that double as puzzles to your pooch. These kinds of toys will keep his brain sharp – and ultimately, your furniture comfortable and free from bit marks. Never buy a German Shepherd a flimsy toy under any circumstances. Any toy that’s not made to withstand a big dog’s bite will have no chance of survival when it meets your dog’s mandibles. Unless you like perpetually sweeping up random bits of toy carcass, don’t bother with anything less than durable. One toy that could be looked at as a controversy of sorts is rawhide. If you get a rawhide that is poorly constructed, hunks of the chew can get broken off and swallowed, where it could cause disruptions in the digestive system. In rare cases, this can cause a need for surgery to take manifest. Granted, instances where huge chunks of rawhide breaking off are not common. Still, if you are considering getting a rawhide chew towy, please take the due diligence needed to make sure you are buying a quality product. If you skimp on the quality level of the chew, you and your dog could pay for it later. A quintessential German Shepherd toy can not only take a beating from some sharp teeth, but it can also be used as a mind stimulator and an impetus for exercise. To that end, you'd be hard-pressed to find a more consistently reliable German Shepherd toy than a classic KONG. The classic red rubber casing is about as durable as toys get, which has positive long-term effects on your wallet. This is more important that you may realize, and for other reasons apart from the obvious one involving money. If you drain a lot of cash on your dog's entertainment, you may develop a case of buyer's remorse that could drive a wedge between you and your pooch. This could especially be rough for your dog since German Shepherds are amongst the most owner-loyal breeds out there. A solidly made toy like a KONG will minimize this from occurring. 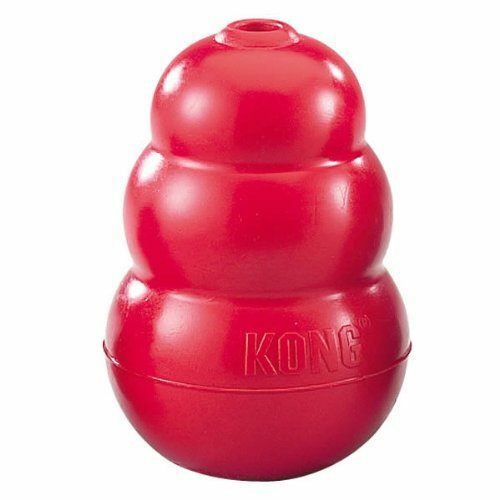 Apart from being protective of your budget, the KONG’s distinctive layered cone shape gives it a terrific advantage over balls should you decide to use it in a game of fetch. The toy will bounce, but you can’t predict how it’s going to bounce. This quirky feature is a boon for keeping your German Shepherd’s mind sharp. Your dog will have a lot of fun trying to figure out where the thing may be headed once the toy strikes the ground. He’ll eventually take the information he learns after a few throws to try and “outsmart” the toy by anticipating where it could go. Because the course of the toy’s direction changes from throw to throw, this will keep your pooch’s mind engaged for the duration of your fetch session. It also gives This lengthy mental stimulation will most likely mean your furniture or your flowerbed will remain safe. Additionally, the KONG's hollow middle is an ideal receptacle for treat stuffing. 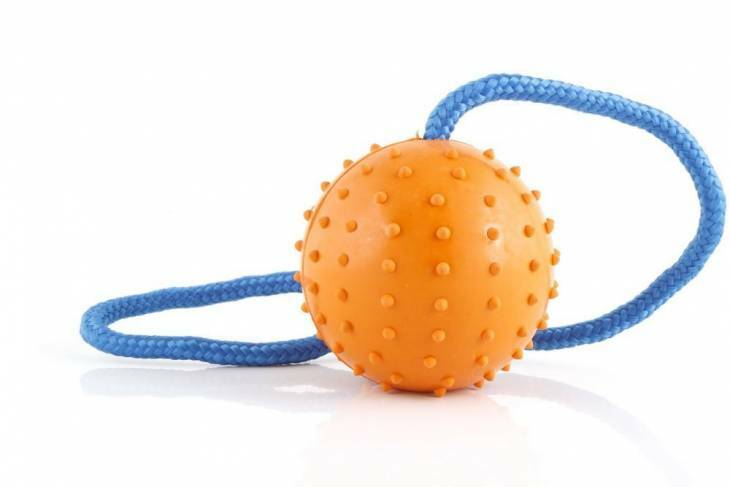 This makes it a great toy to help stimulate your pooch's mind because he will use his noggin to figure out how to get whatever treat waits inside. Considering the toy’s wide berth allows for a pretty hearty reward, you’ll enjoy seeing him give his best mental effort to get to the goodies. If you’re looking for a toy that will allow you to get in a good game of fetch, you may want to look at getting a Nero Ball. This classic ball-on-a-rope device puts you in complete control of the game; by doing so, your dog will develop a strong sense of loyalty with you. This toy also promotes the cultivation of the breed’s protective instincts. So much so, the Nero Ball has been known to be used to train German Shepherds that enroll in K-9 units. And if it’s good enough for these fantastic dogs, the toy is certainly worthy of consideration for your own pooch. Above all else, you should always look at getting a toy that fits your dog’s personality. You know your pooch better than anyone else, and you know how he behaves and how he reacts. You should keep this in mind whenever you’re buying him a toy, or anything related to his overall well-being.